The casts of Agents of S.H.I.E.L.D. 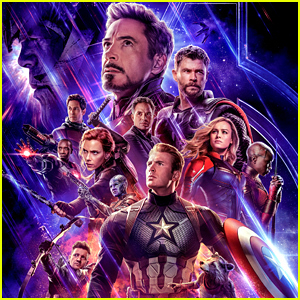 and Cloak & Dagger join forces at the Avengers: Endgame world premiere! 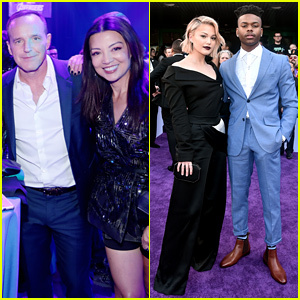 Agents of S.H.I.E.L.D.‘s Clark Gregg and Ming-Na Wen hit the purple carpet alongside Cloak & Dagger‘s Olivia Holt and Aubrey Joseph at the event held at the Los Angeles Convention Center on Monday (April 22) in Los Angeles. They were joined by Agents of S.H.I.E.L.D.‘s Chloe Bennet, Elizabeth Henstridge, Henry Simmons, Natalia Cordova-Buckley, and Jeff Ward, as well as Cloak & Dagger‘s Emma Lahana and Ally Maki. FYI: Olivia is wearing Monse with Rachel Katz and Graziela Gems jewelry. Chloe is wearing a Blumarine gown, Kallati earrings, and Marco Bicego and Djula rings. Ally is wearing Stella McCartney with Giuseppe Zanotti heels, State Property earrings, Eriness Jewelry rings, and an Edie Parker bag. Aubrey is wearing a Perry Ellis suit. 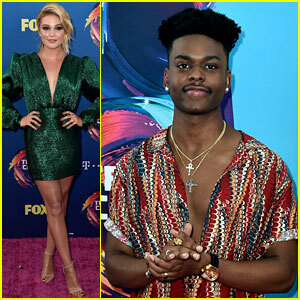 Olivia Holt and Aubrey Joseph walk the red carpet at the 2018 Teen Choice Awards held at The Forum on Sunday (August 12) in Inglewood, Calif. The young stars are both nominated for Choice Summer TV Star for their work in the Freeform series Cloak & Dagger. The Marvel series is also up for Choice Summer TV Show. It’s up against Beat Shazam, The Bold Type, Cobra Kai, So You Think You Can Dance, and Total Bellas. FYI: Olivia is wearing a Daniele Carlotta dress, Nicholas Kirkwood shoes, a kate spade new york bag, and jewelry by Katkim and Carbon and Hyde. Aubrey is wearing Asos pants. Stephen Moyer hits the black carpet at the Entertainment Weekly Comic-Con Bash held at FLOAT, Hard Rock Hotel San Diego on Saturday (July 21) in San Diego, Calif. The Gifted actor was joined by his co-stars Skyler Samuels, Emma Dumont, and Jamie Chung. Also in attendance were Cloak & Dagger‘s Olivia Holt, Aubrey Joseph, and Ally Maki, Shazam stars Zachary Levi, Asher Angel, and Jack Dylan Grazer, The Goldbergs actress AJ Michalka, and Modern Family‘s Nolan Gould. Earlier in the day, Stephen, Skyler, Emma, and Jamie joined more of their co-stars at the Comic-Con panel to chat about the second season of their show. FYI: Skyler is wearing Alice McCall. Olivia is wearing a St. John blazer dress, a Naked Wardrobe bra, Giuseppi Zanotti shoes, and jewelry by Adornmonde and EF Collection. Aubrey is wearing an Asos shirt. AJ is wearing an A Detacher dress. 'Cloak & Dagger' Renewal News Announced at Comic-Con! Aubrey Joseph and Olivia Holt appear on stage during the Marvel’s Cloak & Dagger panel during day two of 2018 Comic-Con on Friday (July 20) in San Diego, Calif. The actors were joined at the event by their co-stars Emma Lahana and Ally Maki. Cloak & Dagger‘s second season renewal was announced during the event and a sneak peek of episodes nine and ten from season one was revealed. “In the words of Lizzie McGuire, ‘this is what dreams are made of.’ Feelings are BEYOND. Thank you so big. Let’s freaking do this, fam. #CloakAndDagger #SeasonTwo #Mayhem,” Olivia wrote on Instagram. The cast stopped by Entertainment Weekly and Marvel Television’s “After Dark” party that night at the Hard Rock Hotel San Diego. They also made an appearance on the #IMDboat for an interview. FYI: Olivia is wearing Swarovski jewelry. Olivia Holt & Aubrey Joseph Open Up About Auditioning for 'Cloak & Dagger' - Watch Now! Olivia Holt and Aubrey Joseph are opening up about their auditions for Cloak & Dagger! The 20-year-old actors appeared on Build Series on Thursday morning (June 7) in New York City. If you didn’t know, Cloak & Dagger is the story of Tandy Bowen (Holt) and Tyrone Johnson (Joseph) – two teenagers from very different backgrounds, who find themselves burdened and awakened to newly acquired superpowers which are mysteriously linked to one another. 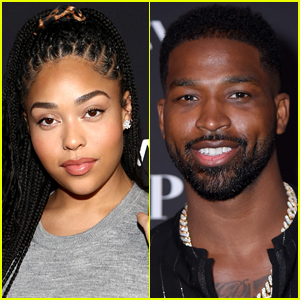 During their appearance, they discussed meeting Black Panther‘s Chadwick Boseman, as well as dealing with real-life issues on the show. Plus, they opened up about their auditions! FYI: Aubrey is wearing an Asos shirt.